C-Flange Adapter is precisely machined to provide fixed motor-to-pump angular shaft alignment within 0.001 mm/mm (0.001 in/in). Adjustable Parallel Alignment of motor-to-pump shaft within 0.05 mm (0.002 in) reduces coupling loads to improve pump, seal, motor and coupling life. 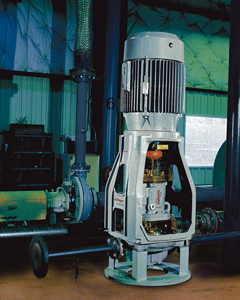 Broad choice of Coupling Design due to precisely adjustable parallel and fixed angular motor-to-pump shaft alignment. Open Motor Adapter permits ready access to seals and seal flush connections for reduced maintenance time.